If you’ve used a desktop 3D printer, you’re likely familiar with the concept of layer heights. Put simply: thicker layers will print faster, and thinner layers will produce better detail. Selecting your layer height is making a choice between detail and speed, which usually works well enough. For example, prints which are structural and don’t have much surface detail can be done in higher layer heights to maximize speed with no real downside. Conversely, if you’ve got a model with a lot of detail you’ll have to just deal with the increased print time of thinner layers. At least, that’s how it’s been up till now. Modern slicer software is starting to test the waters of adaptive layer heights, which change the layer height during the print. So the software will raise or lower the layer height depending on the level of detail required for the current area being printed. [Dylan Radcliffe] wanted to experiment with this feature on his Monoprice Select Mini, but it took some tweaking and the dreaded mathematics to get Cura’s adaptive layer height working on the entry-level printer. He’s documented his settings for anyone who wants to check out this next-generation 3D printing technology without forking out the cash for a top of the line machine. While Cura is a popular slicer, the fact of the matter is that it’s developed by Ultimaker primarily for their own line of high-end printers. It will control machines from other manufacturers, but it makes no promises that all the features in the software will actually work as expected on lesser printers. In the case of the Monoprice Mini, the issue is the rather unusual Z hardware. The printer uses a 7.5° 48-step motor coupled to 0.7 mm thread pitch M4 rod. This is a pretty suspect arrangement that was no doubt selected to keep costs down, and results in an unusual 0.04375 mm step increment. For the best possible print quality, layer heights should be a multiple of this number. That’s where the math comes in. 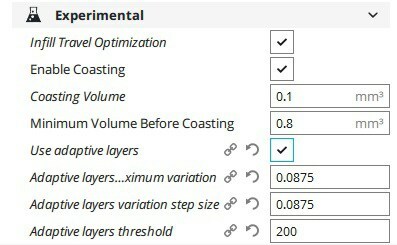 After enabling adaptive layers in Cura’s experimental settings, you need to define the value which Cura will add or subtract to the base layer height. In theory you could enter 0.04375 mm here, but while that’s the minimum on paper, the machine itself is unlikely to be able to pull off such a small variation. [Dylan] recommends doubling that to 0.0875 for the “variation step size” parameter, and setting the base layer height to 0.175 mm (4 x 0.04375 mm). [Dylan] reports these settings reduced the print time on his topographical map pieces from 12 hours to 7 hours, while still maintaining high detail on the top surface. Of course print time reduction is going to be highly dependent on the model being printed, so your mileage may vary. If Cura isn’t your style, our very own [Brian Benchoff] gave us a tour of “variable layer height”, the Slic3r version of this technique. Perfect for that Prusa i3 MK3 you finally spent the cash on. In case you missed it, prices on 3D printers have hit an all time low. The hardware is largely standardized and the software is almost exclusively open source, so it makes sense that eventually somebody was going to start knocking these things out cheap. There are now many 3D printers available for less than $300 USD, and a few are even dipping under the $200 mark. Realistically, this is about as cheap as these machines are ever going to get. A startup by the name of 3D Cultures has recently started capitalizing on the availability of these inexpensive high-precision three dimensional motion platforms by co-opting an existing consumer 3D printer to deliver their Tissue Scribe bioprinter. Some may call this cheating, but we see it for what it really is: a huge savings in cost and R&D time. Why design your own kinematics when somebody else has already done it for you? Despite the C-3PO level of disguise that 3D Cultures attempted by putting stickers over the original logo, the donor machine for the Tissue Scribe is very obviously a Monoprice Select Mini, the undisputed king of beginner printers. The big change of course comes from the removal of the extruder and hotend, which has been replaced with an apparatus that can heat and depress a standard syringe. At the very basic level, bioprinting is performed in the exact same way as normal 3D printing; it’s merely a difference in materials. While 3D printing uses molten plastic, bioprinting is done with organic materials like algae or collagen. 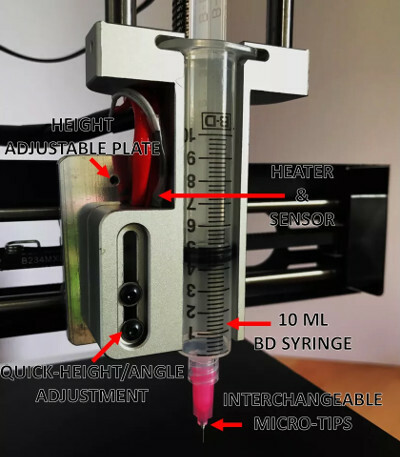 In the Tissue Scribe, the traditional 3D printer hotend has been replaced with a syringe full of the organic material to be printed which is slowly pushed down by a NEMA 17 stepper motor and 8mm leadscrew. The hotend heating element and thermistor that once were used to melt plastic are still here, but now handle warming the metal frame used to hold the syringe. In theory these changes would have only required some tweaks to the firmware calibration to get working. Frankly, it makes perfect sense, and is certainly a much easier to pull off than some of the earlier attempts at homebrew biological printers we’ve seen. We won’t comment on the Tissue Scribe’s price point of $999 USD except to say that in the field of bioprinters, that’s pocket change. Still, it seems inevitable that somebody will build and document their own bolt-on biological extruder now that 3D Cultures has shown how simple it really is, so they may find themselves undercut in the near future. If all this talk of hot extruded collagen has got you interested, we’ve seen some excellent resources on the emerging field of bioprinting that will probably be right up your alley. When the Monoprice MP Select Mini 3D printer was released last year, it was a game changer. This was a printer for $200, yes, but it also held a not-so-obvious secret: a 3D printer controller board no one had ever seen before powered by a 32-bit ARM microcontroller with an ESP8266 handling the UI. This is a game-changing set of electronics in the world of 3D printing, and now, finally, someone is reverse engineering it. [Robin] began the reverse engineering by attaching the lead of an oscilloscope to the serial line between the main controller and display controller. The baud rate is weird (500 kHz), but apart from that, the commands readily appear in human-parsable text. There is a web server built into the MP Mini printer, and after inspecting the web page that’s served up from this printer, [Robin] found it was possible to send G-code directly from the controller board, get a list of files on the SD card, and do everything you would want to do with a 3D printer. After deconstructing the circuit on the display board, [Robin] found exactly what you would expect from such a simple board: an SPI display driven by an ESP, and a big flash chip sitting off to the side. [Robin] found the the model of the display, and quickly built a project on Platform.io to draw text to the LCD. This isn’t the end of the project – there’s still a lot that must be done before this printer is squirting out parts with custom firmware. While this isn’t a hack of the driver board inside the MP Mini, that’s not really a problem. The motor driver board in this printer doesn’t really need any changes, and was already ahead of its time when this printer was released last year. As with most things, the UI is the weak point, and upgrading the firmware and built-in web server for this printer is the best way forward. [Robin] put together a truly phenomenal video of how he reverse engineered this display controller. You can check that out below.